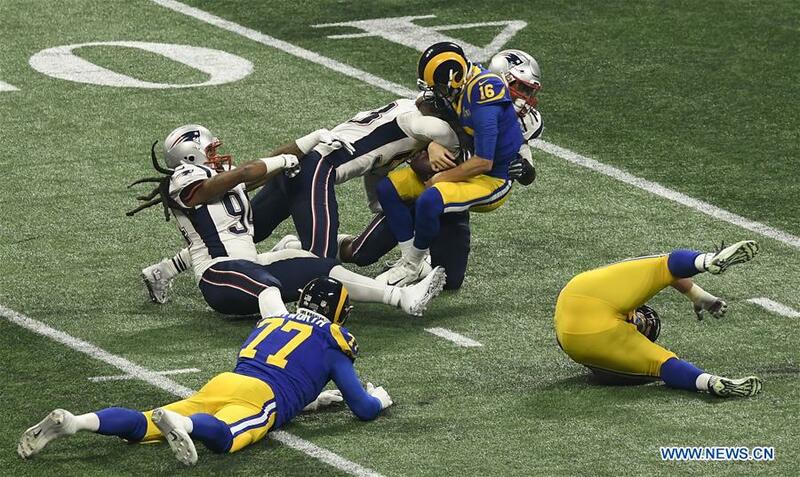 The New England Patriots defeated the Los Angeles Rams 13-3 to win their sixth Super Bowl title on Sunday. It's also Patriots star quarterback Tom Brady's sixth title. Brady, who has won four Super Bowl MVP trophies, looked rusty through the game played in Atlanta, but his pass in the fourth quarter set up rookie Sony Michel's emphatic score -- the only touchdown in the lowest-scoring Super Bowl ever. "Finally we got the touchdown and the defense played the best game of the year," Brady said after the game. "This whole year, this one was the biggest team win, the biggest team Super Bowl that I've ever been a part of," said Brady's teammate Rob Gronkowski. While the Rams had to pay the price for the mistakes they made in the game. "They did a great job. I'm disappointed that I didn't do a better job. I think there are some decisions that I'm going to wish that I could have back," Rams coach Sean McVay said. ​The New England Patriots defeated the Los Angeles Rams 13-3 to win their sixth Super Bowl title on Sunday.